Coupon Based Rewards, as a use case, is among the most popular choices of rewarding users for their efforts in influences personal & friend circles with respect to apps. The ease of procuring such coupons from 3rd Party stores simply helps the agile marketing efforts of a fast growing app. While Wallets increase retention, Coupons would be the better bet when beginning your marketing campaigns. It simply is less collateral at stake, compared to the mammoth task of implementing a Wallet inside the app. Let us define an example use case that can help us understand how one can implement the Coupon Based Rewards program using AppVirality. We are a up-and-coming Health Consultation app. We help people find quality doctors, physiotherapists, etc. in their city. We aspire to acquire as many new users for the app, as may be possible. We want to run a Referral program to acquire these new users. This step will cover all the actions you need to undertake at the Dashboard level. Begin by adding your app to the Dashboard. You will need the basics like: your App/Play Store URL, App Name, etc. On the Dashboard, you will find a ‘Add New App‘ button (almost center aligned, at the top of the page) on the orange strip bearing AppVirality logo. It will open a new panel/sidebar, from the right of the screen. Paste the App/Play Store URL for your app at the topmost field. Hit the ‘Tab‘ on keyboard; or click just anywhere outside the field. The system shall auto-fetch all other relevant details. Fill up any other data that may be needed/relevant, and Save the App. That should get you app added to the Dashboard. Now proceed to create a Growth Hack Campaign for your app. From the Side Panel on the left, click on the Arrow. Here you shall see that there are no campaigns for you currently. Keep a note of the AppKey displayed under the app. This is the same one which you must use while integrating the SDK with your app. Click on the Create Campaign button, visible in dark blue to the right of the screen. As per current use-case, to select the Campaign Type: In App Referrals, Click on the Start button under it. Name your Campaign. Enter a relevant Campaign Name. Note: This name shall not appear anywhere in your app or any user facing interface. This is solely for you own identification. Select the Reward Unit for the campaign. When you select & commit the Reward Unit, only then you would be able to define Reward Rules. When the Reward Rules panel gets activated, you can add reward rules based on the use case we discussed at the beginning of this post. Now that all the Reward Rules have been added, you can define Maximum Reward Limit i.e. Redemption Cap and Minimum Review Period. Redemption Cap allows you set a maximum limit on the earnings for a user, from a campaign. Minimum Review Period holds the rewards, Under Review, till the defined time frame, thereby not allowing users to utilize the rewards immediately. This period defined could help you run background checks on the validity of the rewards. This is where you will switch on-off, and select the order of appearance for the various social channels that would be displayed to your end users, on the Referral Screen. After the above steps have been done, you are almost done with your campaign creation process. This step here will enable you in designing the look of the Referral Screen on the end user’s screen. As you can see, it’s a preview on the device and allows tweaks to the tittle & description. Observe that only those Social Channels are visible, which you have selected or switched ON in the earlier step. In the Campaign Description field, an auto-generated catchy one liner is supplied by the system. Change it to suit your brand and communication, as you please. Campaign Image can be changed from the default provided – to include something of your own choice. Choose a File Location to upload image. Close the window/panel when you are finished. Now that all is done – go ahead and Save Campaign to lock-in/commit the changes done. It is possible you may not be seeing the changes done in the Reward Rules, with immediate effect, in your app. Nothing to panic. The SDK simply needs to refresh the updated campaigns data to have them on the device too. Solution: Kill the App and relaunch. Doing so would force the SDK to refresh campaigns data, and then immediately you shall see the campaign with the updates you made to the campaign. Once you are done with your Campaign Rules creation, your next initiative should be to configure rewards for the same. This should not be confused with creating rules for the reward – which we did just previously. Here you are configuring rewards type and distribution. In this particular use case, we are focusing on implementing a solution that would allow you to reward users, by delivering them their rewards as coupons. When you use coupons, AppVirality will do the job of handing out rewards (as coupon codes) to the user persona, as and when a specific conversion event is triggered. This implies, unlike for Webhooks, you need not call the Redeem Rewards API for authenticating the rewarding of users. What is a Coupon Pool? So each coupon pool is a collection or pool of similar coupons – all of same value, and belonging to a single reward type. Thus, you have a varied set of coupons to distribute – which you can now map to beneficiaries based on the reward events that you have defined. All that would take you to do is just to map the desired coupon pool to the reward event you have planned it for. A user keeps accumulating rewards on an incremental basis, as and when some conversion event (Friend Sign-up, Friend Transaction, etc.) keeps happening. When user earnings reach or exceed the coupon value (of the coupon pool mapped against the reward event), then one coupon is released and distributed to the user immediately, by AppVirality. In a nutshell, a coupon pool allows you to group a similar set of coupons – which can be delegated/scheduled to be distributed to specific rewards only. 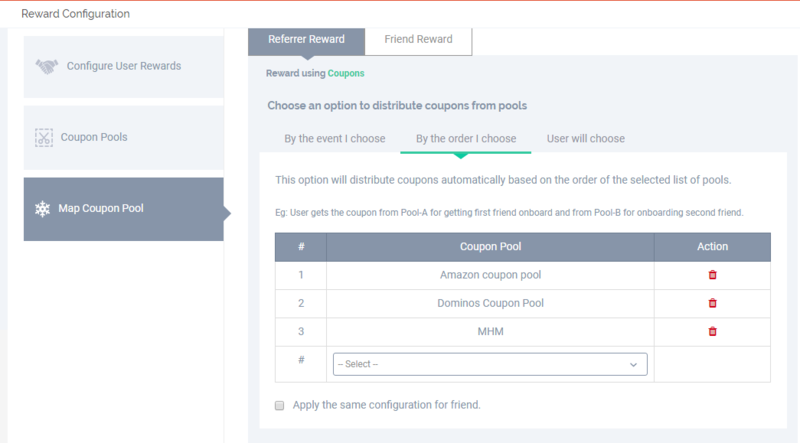 After defining the User Reward type as Coupons, now under the section Coupon Pools – add/create a new Coupon Pool. Add a Description, Image URL(if any) & Save! Once you have declared a coupon pool,next step is to upload the relevant coupons to it. For Single Coupons: Set the Coupon Code, set a quantity or set an unlimited supply, assign an expiry date. For Multiple Coupons: Copy-Paste the set of Coupon Codes as plain text or upload in a CSV sheet, and assign an expiry date to them. Take a look at the sample CSV file for multiple coupons upload before you go ahead with it. You are now ready to map the new coupon pool to a reward event! For this use case you will be uploading Multiple Coupons, and we advise you use a CSV file to upload the coupons. Below are simple examples of how you can add coupons. Once your coupon pools are ready, it is time to map them to the right events – as per your reward rules. AppVirality allows three different ways of coupon distribution. Hence, you can map the coupon pool to the beneficiary type (Referrer/Friend) in 3 ways. The tabs listed below shall explain what each method implies. Toggle between them to understand all cases. This would automate an order of coupon distribution for the campaign, based on the order in which you declare your coupon pools. If your order is set as, Coupon Pool A, followed by B and the last being C, the outcome order of coupon distribution would be:1st coupon disbursed goes from A, 2nd coupon is disbursed from B – and thereafter all coupons are disbursed from C.
Herein, you map a Coupon Pool to a specific event, thus ensuring that only coupon from a particular pool are used for a certain type of conversion event. Suppose you have rewards for the Friend when he signs up and for the Referrer when his friend transacts, you may allocate separate pools for coupon disbursal to each. This allows your end users to pick a coupon from the existing set of coupons pools. For this use case, let us take By the Event I choose mapping method. According to reward rules, Friend would earn $25 on Sign-up. So only Sign-up event is shown. According to Reward Rules, the Referrer can earn both on Friend’s Sign-up and Transaction. So you have two events listed. Now when Friend will sign-up, one Dominos coupon would be picked from the pool and delivered to him/her. Due to this, the Referrer would also earn $10, and hence an Amazon coupon will be delivered to him too. From drop down, select Amazon Coupon Pool and Dominos Coupon Pool . Now when friend signup, both friend and referrer will get $25 and $10 respectively. Now for friend Dominos coupon and for referrer Amazon coupon will be distributed. If friend does a transaction referrer gets $5 rewards but in the reward configuration we have Dominos coupon of value $25 in order for referrer. so his friends has to do five transactions , each transaction of value more than $100 to get the coupon distributed. In the Map Coupon Pools section, select User will choose. you will see only Referrer Rewads tab because both referrer and friend can redeem coupons from same pools. From the drop down, select Dominos Coupon Pool, which has coupons worth $25 and Amazon Coupon Pool , which has coupons worth $10. Now when friend signup, both friend and referrer will get $25 and $10 respectively. 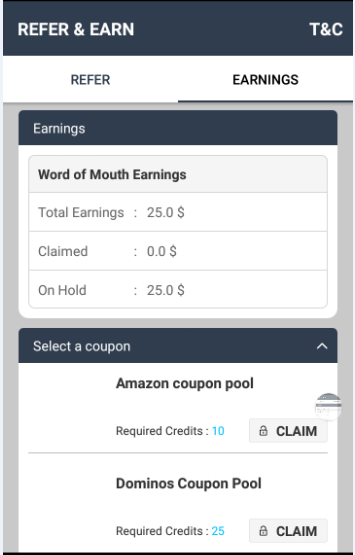 Friend can see both the coupon pools (Dominos Coupon Pool,Amazon Coupon Pool) claim button enabled to redeem the rewards in earnings screen because the reward value is $25. 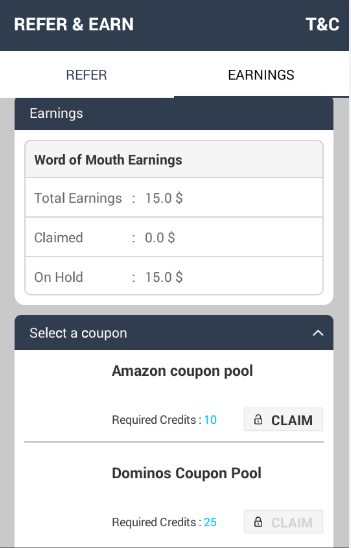 Friend can redeem reward from any coupon pool.If you click on claim button on any coupon pool then the claimed coupon will be distributed to the user. But for referrer, only Amazon Coupon Pool will be enabled Dominos Coupon Pool will not be enabled to redeem rewards in earnings screen because the reward value of referrer is $10.If the reward value of referrer reaches $25 then Dominos Coupon Pool will be enabled to redeem rewards.Here user can claim Amazon coupon by clicking on claim button. Since your rewards are also in place for your campaign, it would make sense to have automated Notifications to communicate to users about rewards and conversions. Post Reward Configuration, it is required that you set in place the process of automating notifications for your End Users when they are rewarded. AppVirality will help you do most of that. For notifying your user via email, AppVirality allows you to fire direct mails through your SMTP server – employing wise & intelligent templates that are available to use. You can thereby create new templates too. Feel free to use the given replacement token as you feel fit. Just navigate to Notifications from the Dashboard. Add an email ID – one which would be dedicated as the support email ID for delivering mail notifications to end user.Click Here for how to add Mail accounts in dashboard. Make sure you have set the Status for the template as ON. This shall ensure mail notifications to your users, as and when they get rewarded. Configuring your push notifications for AppVirality events is typically just as easy as setting up the email notifications. Mainly, update the GCM API Key as provided by Google Messaging Services. Select an appropriate template for your push messages. With this, we have finished the Dashboard Setting for the Wallet Based Rewards use case. Now, you are already setup with your reward rules, the reward distribution mechanism and the modus operandi to notify your user on being rewarded. This is about the right time to wind up the SDK 2.0 integration with you app. While integration is an important aspect, please take special attention towards ensuring you are sending across the Conversion Events. That would conclude the App & SDK integration for the Wallet Based Rewards use case. Now your campaign is ready & so is your app, along with the SDK. Things are warmed up for the execution of the Wallet Based rewards campaign for your app. Begin by Testing the app, for the use case and the reward rules. You try running a Test cycle to check and inspect how the payloads arrive at your Bin URLs. Follow the steps listed above, and check the Bin URLs for each event separately. The above testing Guide is comprehensive in every angle. For each step in the Testing Scenario, there are clear instructions on how the step would interpret in the Analytics. When executing the steps, make sure you Check you Dashboard’s Analytics as stated in the guide. Along side that, for every such Event stated in the Guide – crosscheck your event’s dedicated Bin URL too – to see how the payloads vary.